When the iPhone and the iPod touch were first introduced to the masses half a decade ago, many people figured out that the iPod touch was the iPhone – sans the phone part, of course. Well, the iPhone went on to be a huge success around the globe since then, and the iPod touch, well, it continued to reign as the top portable media player in the market, but over time, you could be sure that smartphones took over the portable media player’s mantle as a to-go entertainment device of choice for the masses. Well, if you happen to own an iPod touch, how about giving it a new lease of life with Dexterity’s MorphCase? 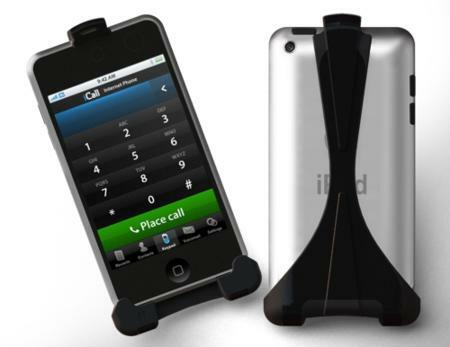 This unique case is capable of transforming the humble iPod touch into a Wi-Fi mobile phone – and you do not even need a headset or a Bluetooth device to boot. Let us see how this is achieved in the extended post. For starters, the MorphCase will play nice with the second, third and fourth generations of the iPod touch, where it will make good use of the audio jack input with any voice over IP (VoIP) app, hence eliminating the need for pesky external wiring or a headset. In fact, it will also come with a built-in speaker that is located at the top complete with a microphone at the bottom, similar to how a traditional phone works. I guess you can say that the composition of “smart” in this “smartphone” is far more than that of a “phone”, but at least you are still able to make a call with a data connection. After all, many people have fallen on economically difficult times, hence it makes perfect sense to examine one’s spending habits and cutting down on paying for multiple cell phones, data plans, usage fees and monthly cellular bills. The MorphCase will take advantage of any Wi-Fi hotspots around, and once connected, you can use an app like Skype (make sure you have credits inside if you want to call a mobile or landline number!) to keep in touch with the rest of the world. Color choices for the MorphCase include Black Fury, White Lightning and Limited Edition Chromax, retailing for $49.99 a pop although pre-orders are slightly cheaper at $35. I’m Adrienne, I created the MorphCase, and I want to thank Edwin for this article! I know everyone thinks you need cellular to be mobile these days, but we are on the brink of a wi-fi explosion. The technology for a Wi-Fi phone won’t need a cellular data network to always be connected in the future. Wi-Fi networks are easy and inexpensive to set up as compared to a cellular tower. I know…I get super-excited when I talk about wi-fi and the possibilities ; ) So many companies have these great ideas with wi-fi and no one has thought of collaborating and putting them together, yet : ( My company is small, but that is all I think about. How great would it be to have our cable/internet/phone/mobile phone bill for everyone in our family be something like $20/month…have the security of being connected to our home network…and have lightning fast speed by using several connections together? I’ve launched on Indiegogo hoping to gage the public interest. I leave for China next week for the factory selection through Dragon Innovation (Dragon is the company handling production of the Pebble Watch). I’ll be posting updates/photos of everything as I work toward getting it manufactured so people can have confidence that this is a product that will be made and I hope it will make them want to back my campaign.